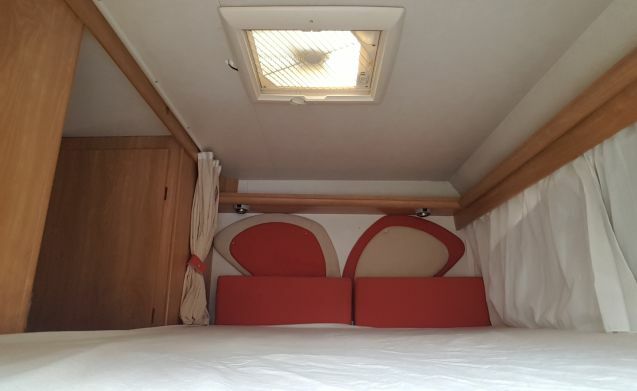 With a spacious double bed in the alcove (length 205 cm), and behind a double bed (205 cm). The double train seat can be converted into a double bed; this way you can make 6 sleeping places! To the right of the outside door is the kitchen with a 3-burner gas hob, sink with hot and cold running water. To the left of the outside door is a large fridge with separate freezer, works on gas, electricity and 12v. 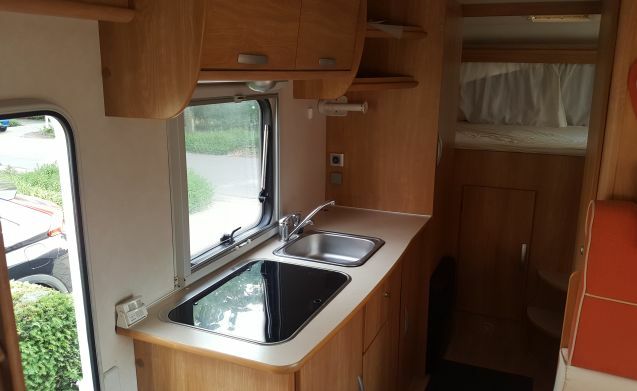 The camper also has a spacious bathroom with shower and cassette toilet and storage cupboard. 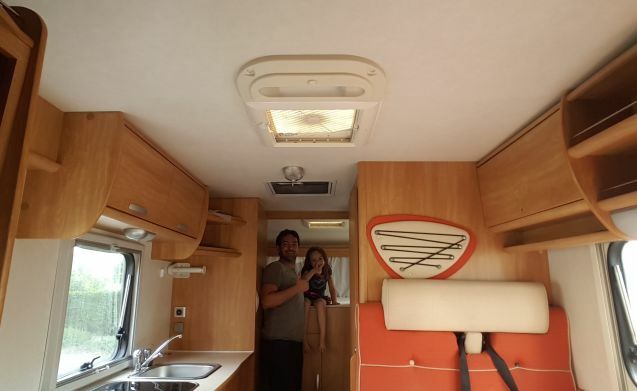 There is a lot of storage space available and the camper is also equipped with a solar panel, residential battery and tables where music (spotify), films (netflix) and or games can be played. 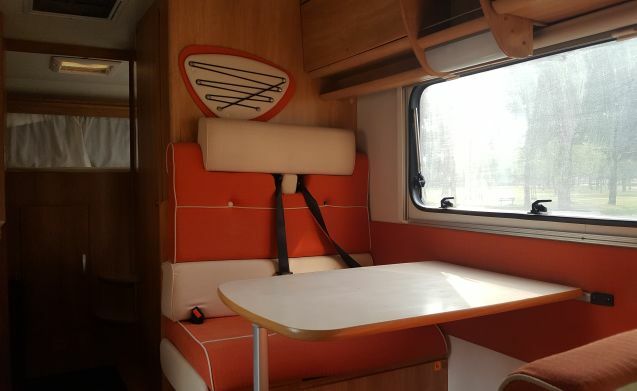 The layout of the camper (with a double bed in the back, gives extra luggage space. You can enter this from outside (both sides) and from inside. The windows of the living area are equipped with mosquito nets and blackout curtains. There is a radio CD in the cabin and the front seats have armrests. The camper is equipped with ring heating, hot water supply, reversing camera and telephone holder so that you are navigated safely. You can park your bicycles in the garage (5 bicycles) and a large canopy on the side . There is also an outside table with 4 comfortable garden chairs and 4 folding stools. The inverter from 12 volts to 220 volts supplies power together with the solar panel. The use of large power consumers such as the kettle, coffee machine, hairdryer etc. is only possible when the camper is connected to the power supply of the campsite or camper place. 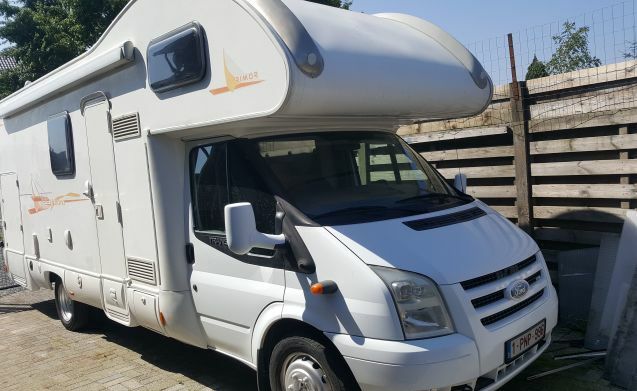 The camper is supplied with a full diesel tank and must also be refueled when it is returned. 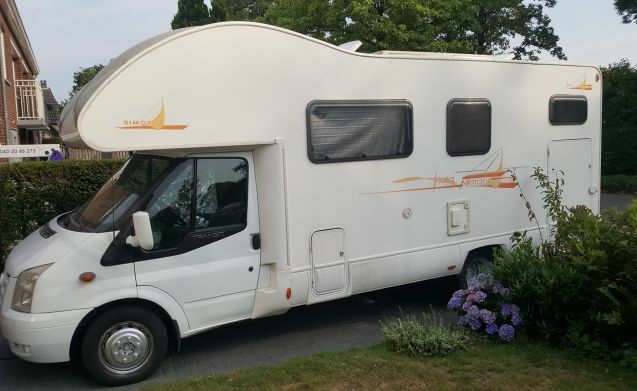 If the camper is not returned with fuel, the rental company will take care of the fuel, the tank amount + the surcharge of € 10 will be deducted from the deposit. The consumption of gas, 1 full gas bottle, is included in the rent. 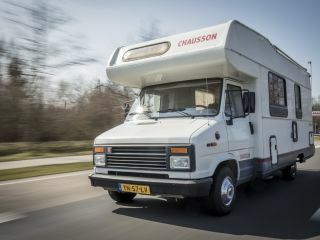 The Camper is all-risk insured and has a deductible of € 1000. This is processed directly at the Goboony site when booking. The renter is fully responsible for any seizure of the vehicle by, for example, transporting drugs. The resulting costs and loss of income are fully charged to the tenant. The renter is responsible for the weight of the camper. If you have a driver's license of up to 3500 kg, you also have the responsibility not to load more than this weight. In the high season (July - August) the camper is rented out at least per week. 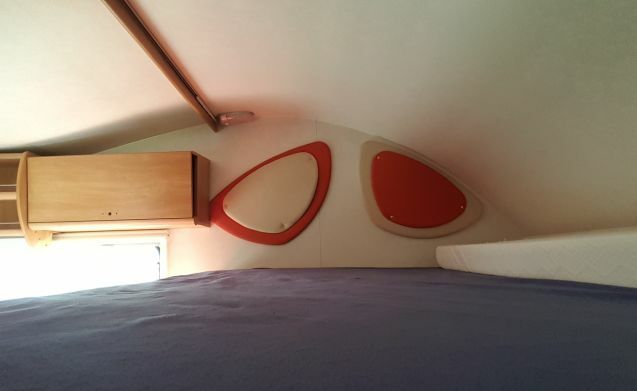 The rest of the year the camper can also be rented for shorter periods; minimum of 3 days. 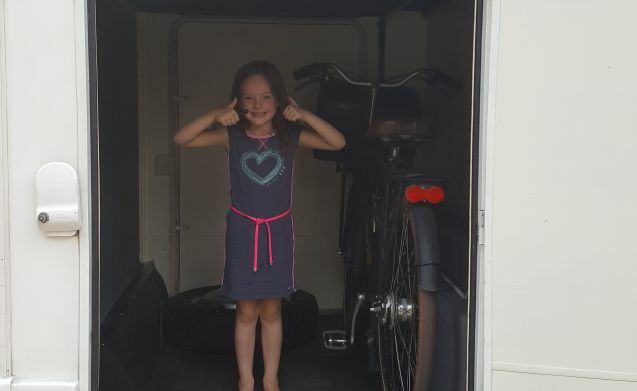 We are careful with our camper and assume that you are too. 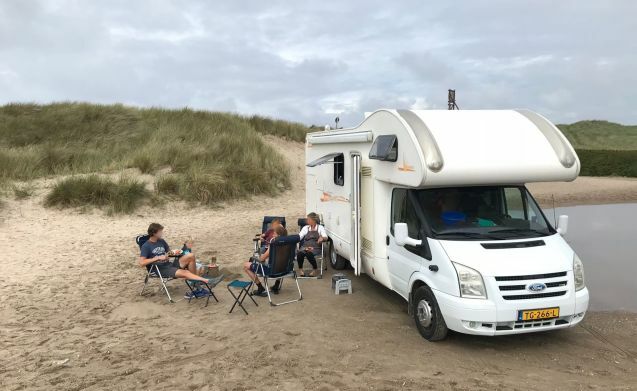 In this way, everyone can enjoy the freedom that our camper will offer you to spend the night at beautiful locations where you would never have been able to without a camper. If you want to rent our camper, we would like to know a little more about you before we accept. Who goes with you (age) What is your travel destination (country). 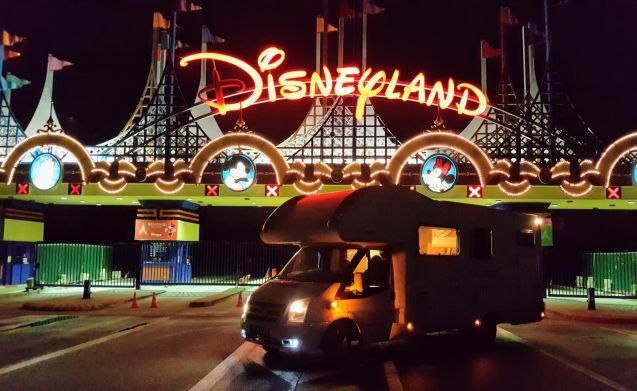 TIP: Disneyland weekend! Very nice and easy way to visit this great park! And cheaper is almost impossible. Camper place at the entrance and you can sleep peacefully and cook in your own place. The camper is delivered to you both inside and out. 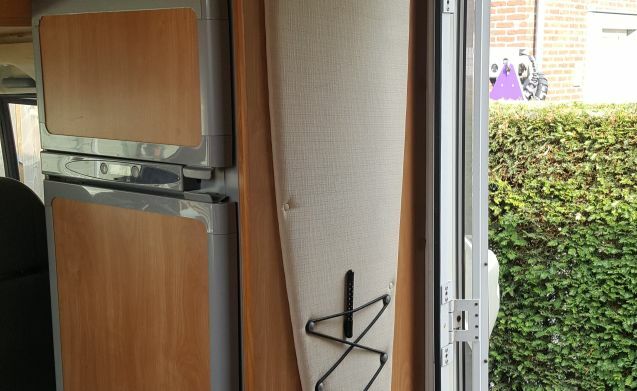 When the camper is returned, the tenant is expected to clean the inside of the camper. If this has not happened then we will keep 100 euros of the deposit. The outside is cleaned by us. The waste water tank must be empty and the toilet cassette empty and clean. Smoking in the camper is strictly forbidden! Nonetheless, smoking will be deducted from the security deposit of € 200. With your dog in the camper? Then we expect the dog not to come on the benches and you paid extra attention to cleaning the inside of the camper. Should it be the case that dog hair and / or other dog tracks are left behind then extra cleaning costs of € 100 will be charged. The tenant is responsible for any damage resulting from negligence, also broken tires and traffic fines are for the account of the tenant. 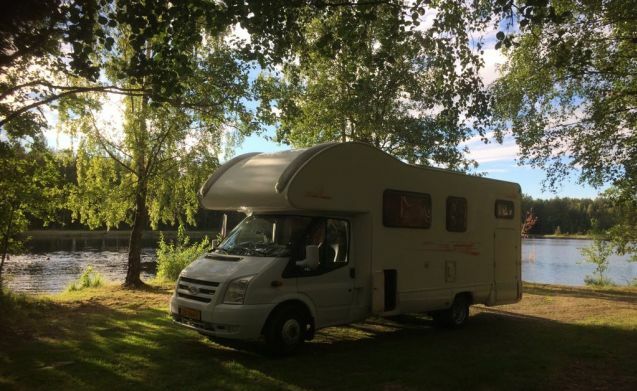 In case of damage, we will go to a camper recovery company and on the basis of the quotation the deposit will be settled. The tenant may have an expertise against it. The driver may not have had a driving ban in the last 3 years! 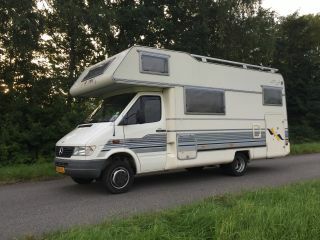 Strong family camper for 6 people on B driving license with towbar and garage!